Gweru philanthropist, Smelly Dube, is an unassuming woman who is always working towards improving the lives of fellow human beings. She has constructed low-cost houses in Gweru, Zvishavane and Bulawayo, among other areas through her company, River Valley Properties. Drawing inspiration from her role model, the First Lady, Cde Grace Mugabe’s charity works, Dube adopted two charity homes in Gweru four years ago. But her persona is far removed from your usual picture of a hero or successful businesswoman. Short, small in built and humble, the soft-spoken businesswoman’s appearance belies her herculean work of providing accommodation to Zimbabweans. Her life has impacted positively on the lives of many people in the Midlands and even beyond. She is the brains behind the construction of Gushungo House, a township tourism initiative in Gweru. Gushungo House is a picture gallery in Woodlands Park Suburb that depicts the life of President Mugabe in his early days up to today as President of Zimbabwe. Her benevolence has touched the lives of residents at Batanai Old People’s Home and Midlands Children’s Home. A fortnight ago, Dube threw two separate parties for the two homes to mark President Mugabe’s 92nd birthday. In the past four years Dube has religiously hosted 21st February Movement surprise parties at the two homes in her capacity as patron. The President’s birthday now has a special place on the calendar and hearts of the two homes’ residents. “Towards the end of February every year when our President celebrates his birthday we will be celebrating with him here. We now know that Mrs Dube always has something for us. The only surprise we got this time around is that apart from the nice food, she brought a pair of shoes and a suit for each one of us,” said Obert Gudu, 86, a resident of Batanai Old People’s home. Dube and her staff from River valley Properties had lunch with the elderly at Batanai Old People’s Home a fortnight ago. They spent the entire day with children at Midlands Children’s Home while celebrating President Mugabe’s birthday. To the children at Midlands Children’s Home, Dube has become the mother they had yearned for many years. The elderly regard the businesswoman as the loving and caring daughter they dream of. She routinely donates groceries and other goodies to the two charity homes. She also avails funds for repairs and maintenance work that include fixing electrical faults among other side-jobs. Dube views her role and duties at the two homes as natural and normal. She has, in fact, become the sole sponsor of the two homes. She and her staff value the time they spend with residents of the two homes as they celebrate President Mugabe’s birthday. As early as 9AM on a hot Saturday two weeks back, River Valley Properties employees swarmed Batanai Old People’s Home, making a rare beautiful spectacle. They were sweeping and picking up litter with their navy-blue uniforms blending well with the clear blue sky. Their activities brought life to the usually quiet home which houses 10 elderly men and three equally old women. Flashes of joy and hope gleamed on the elderly men and women’s faces as they enjoyed the rare opportunity of interacting with the “outside” world. They caught up on current affairs while eating two pieces of chicken and hot chips that Dube’s company had bought from a local fast food outlet. “I don’t remember when I last had roasted and spiced chicken and chips for my lunch. It’s certainly a long time ago when I was still young and attractive. This gesture by Mrs Dube has invoked nostalgic memories when I used to fend for myself,” remarked a shaking Gogo Ndlovu, 72, her flimsy hands clinging on to a reddish kaylite container full of her sumptuous meal. After the meal the elderly residents were presented with a pair of shoes and brand new suit each. Guests enjoyed the sight of the senior residents as they expressed their joy and gratitude for the new set of clothes with the excitement of infant pupils on their first day at school. “Halala, yea, you are indeed heaven-sent my daughter. I can’t believe I’m going to put on a new suit,” shouted one of the elderly women in joy as she accepted her gift from Dube. River Valley Properties planted 89 plants at the same old people’s home in 2013 to mark President Mugabe’s 89th birthday then. The staff led by Dube took time to visit the orchard which is now lush green, sprucing up the home’s yard. River Valley Properties staff left Batanai Old People’s Home at around 1PM for Midlands Children’s Home after conducting a prayer and handing over a grocery donation worth $1,000 to the old people’s home Matron, Joyce Bomvu. 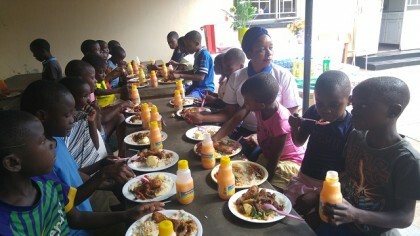 At Midlands Children’s Home, the company prepared food for the more than 50 children before serving them. The company staff later donated groceries worth $1,000 and some soccer and netball balls for the kids. Dube says she decided to spend time with the residents of the two homes so that they don’t feel secluded. She says President Mugabe’s birthday celebrations were a national event to be celebrated by every Zimbabwean. “I made a commitment to celebrate our President’s birthday with the residents of the two homes. Every year in February, I host a party for the two homes to celebrate President Mugabe’s birthday. It is my thinking that on days and months like these when the nation will be celebrating the birth of an icon, our father, President Mugabe, we should also remember these people in old people’s and children’s homes. It is our duty to also make sure they celebrate this special day as they are a part of society,” she said. Dube said the two homes were on the company’s budget, taking the responsibility of buying groceries and at times clothes for the elderly and children. “My inspiration is the First lady who took upon herself to build a massive Mazowe Home for the upkeep of the less privileged,” she said. Pretty Dhliwayo of Midlands Children’s Home saluted River Valley Properties for coming to their rescue whenever they run out of provisions. “As a children’s home we heavily depend on donations. Companies, organisation and individuals donate to us. They give us what they can afford. At times we experience food shortages but in such situations you can’t then approach a donor and complain to them that the food they donated last time has run out. It’s not their prerogative. I’m happy Mrs Dube and River Valley Properties have become part of us, we can afford to call them, raising an alarm, she has become our mother,” she said.